Mention the phrase “Sunday school” to most people, and if they grew up in a church-going family then the chances are it brings back memories of rather dry and dusty (in more ways than one) Bible stories read from faded, dog-eared books in classrooms for which the word “beige” would be far too exciting. I can still remember the ticking of the clock, and time passing so slowly that I could watch the minute hand move. These days, even the name has gone out of fashion, to be replaced by “Children’s church”, or something topically meaningless, and applied to an activity that is often little more than a child-minding service while the grown-ups get on with the serious business of the liturgy. But it wasn’t always like that. Robert Raikes was a newspaper publisher, a business that he inherited from his father. Like his contemporary Josiah Wedgwood, Raikes believed in the importance of philanthropy and social concern, although that’s pretty much the limit of their similarities. Raikes was well-to-do by the standards of the time, certainly, but his wealth didn’t approach Wedgwood’s and, unlike Wedgwood, he was never involved in the burgeoning London social and political scene. Comfortably middle class rather than prosperous, Raikes did his philanthropic work primarily in his home town of Gloucester. Raikes’ particular concern was for those incarcerated in the workhouse, and came to the conclusion that there existed a social underclass whose lack of employable skills would almost inevitably lead them to a life of dependency and crime. His solution was the same one that most politicians tend to suggest for the same problem today: Education. The difference is that Raikes thought of it first. 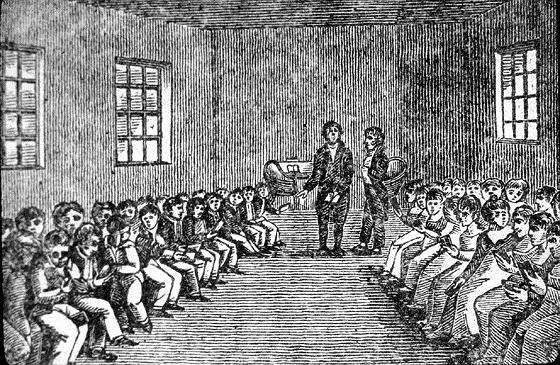 In the late 18th century, education was only available to those wealthy enough to purchase it. Raikes set out to change that. He set up and funded a free school for slum children, initially in the home of a lady who we know only as Mrs Meredith. Crucially, because the children would usually be working for six days of the week at the local factories, his school operated on the only day they were free to attend: Sunday. The curriculum started with basic literacy, and then proceeded on to the catechism. This was not without controversy. Some opponents of his schools considered that teaching – even voluntarily – was contrary to the Biblical prohibition of work on the Sabbath. Others feared that the schools would be a means whereby Raikes would be able to indoctrinate other people’s children with his own political ideas, their parents being a captive market for his schools because of their inability to buy it themselves in the free market. And some complained that, by offering education at no fee, Raikes was stealing the livelihoods of tutors who eked out a living delivering limited education to those who could just about afford it, but barely more. Despite this, “Raikes’ Ragged School”, as it was dubbed by his detractors, was a success. Within just a couple of years, his one school for boys only had multiplied to several schools in and around Gloucester catering to both sexes. Ten years later, in the 1790s, the movement had spread widely enough for Adam Smith, author of The Wealth of Nations, to give it his endorsement. Raikes died in 1811, but by then the momentum was unstoppable and by 1831 no less than 25% of the child population of Great Britain was in Sunday school each week. Other than the first few schools in and around Gloucester, Raikes had no direct involvement with other schools in the growing movement. But, in retrospect, this is what gave it its strength. Raikes didn’t start something that was to be independent of the churches. Instead, he led by example and inspired the churches to continue it themselves. All across the country, Sunday schools were set up by local clergy and laity and funded by the church and local philanthropists. Raikes created a template, not an institution. By the time that parliament legislated for compulsory education in 1880 – almost exactly a century after Raikes founded his first Sunday school – the Church of England was by far the largest provider of education in the country. That legacy lives on in the faith school sector of today’s state education. The school my daughter attends was originally set up in 1896 as a “National School”, a school run by the Anglican National Society for the Education of the Poor – an organisation which in turn could trace its own lineage back to the Sunday schools that grew from humble beginnings in Mrs Meredith’s Gloucester house, where a small group of children gathered together to learn how to read and write. The idea that even the poor have a right to education took a while to take root. Without Robert Raikes, it may never have taken root. But the belief that all children deserve an education, irrespective of their parents’ ability to pay, is so uncontroversial now that it’s practically taken for granted. A great British value, if ever there was one.